I have a serious weakness for Mexican food. Considering that I live so close to the border, my weakness for Mexican food translates into us eating out. A lot. This is one of my favorite recipes that I use to combat my need for salsa and guacamole. 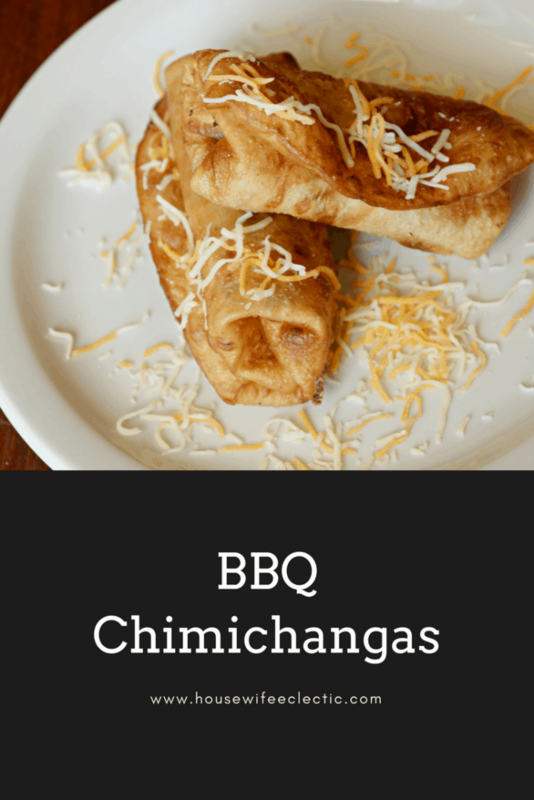 It is crispy on the outside and full of BBQ flavors on the inside. As a major plus it involves the crock pot, I love anything that involves my crock pot. Add everything besides the meat to the slower cooker and mix well. Add the roast and coat the roast in the sauce. Cook on low all day. When meat is done, shred with a fork. Stuff the meat in a flour tortilla and wrap like a burrito. Pin it shut with two toothpicks. Deep fry until golden. Top with salsa, shredded cheese and sour cream.This is seriously delicious. It is perfectly crunchy and tangy! What is your favorite way to eat a chimi? I am with Megan — I saw strawberries and whipped cream on top. But I can probably content myself with meat.